The Derbyshire Disability Cricket Club. Derbyshire Disabled CC is the premier cricket club in Derbyshire for players with a disability and it has seen a big development since it formed 10 years ago. When first team player Ian Morton was asked what was the key to the club's success over the last decade, he said: "commitment and dedication of everyone involved at the club." Ian added: "When the club began they only played friendly matches as they were not entered into a league. "However, due to the hard work of the coaches and all involved at the club, 2015 became our first competitive season." The team take to the field. Given it was the the first time the club had measured itself against others out on the field of play, it was all the more special they were able to go on and claim a National League title. The team won seven out of their 10 matches to take the title at the first time of trying in what Ian felt was "an amazing achievement by all". The club boast a strong squad of players that make up two teams who play competitively - the Merlins development team and the Falcons. Darley Abbey CC offer Derbyshire Disabled CC fantastic support in many ways including sharing their ground for matches and training. There is also a strong coaching workforce at the club with six coaches giving their time week in, week out during both the summer season and winter training sessions. Senior Cricket Manager Mick Glenn from Derbyshire Cricket Board is full of praise for the club commenting: " Since its formation in 2005 the club has led the way in providing disability cricket opportunities in Derbyshire. "The success in 2015 was well deserved and a tribute to the tireless work of the club and its volunteers". Ian's background as a player is vast; he started playing in 1998 when he signed for Nottinghamshire, 6 years later he was selected for England. 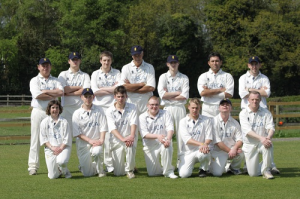 A ground breaking game was played at the Rose Bowl in Southampton that year as it saw the start of the new England ECB disability cricket team. The England Disability Cricket Pathway is set across four main impairment groups - visual, hearing, physical and learning - for a full overview click here. There has never been a better time for people in Derbyshire to get involved in disability cricket, with more opportunities than ever before. Through its community programme the Derbyshire Cricket Board is delivering cricket sessions into schools and community settings. With more disabled people being given a taste of cricket, the long term aim of the cricket board is to have more clubs following in the footsteps of the Derbyshire Disability Cricket Club. For further information about disability cricket in Derbyshire contact mick.glenn@dcbcricket.com or 07976 504276. The club trains at Darley Abbey CC on Tuesday evenings at 6pm throughout the cricket season. New players and volunteers are always welcome, for more details on how to get involved or contact Nigel Theobald (nigel.theobald@gmail.com), Philip Lucas (phil1987@tiscali.co.uk) or through the club website.